Yesterday, before taking the kids to the movies, the kids and I stopped at the pet store to pick up supplies for Zoe, Butterscotch, and Disco, as well as the fish at school. I finally took the plunge and purchased a cat tree for our newest addition, Butterscotch. We acquired him about 6 weeks ago at an animal shelter. Anyway, I paid for the cat tree, but asked them to hold it until today. My husband just brought it home a few moments ago. We put Butterscotch on it, showing him all the levels and the tunnel. He hasn't left it since. He is cracking us up with his antics. 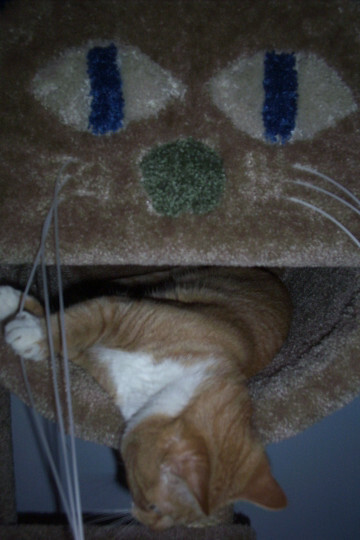 The tunnel to the cat tree has a face of a cat with long wiskers, which he loves to play with. 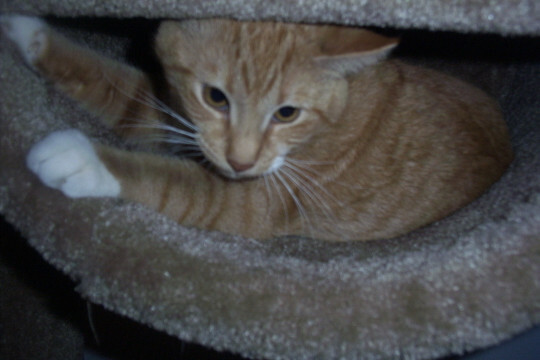 It's a total riot when he pops his head out of the hole at the top of the tunnel and attacks the top level. Every now and then, he gets on the top level and stares up the wall. I can just imagine that he is trying to figure out whether or not he could climb higher. He is one of the funniest, and definitely the sweetest cats that I have ever had.